Sigmund Snopek III - "Trinity Seas Seize Sees"
Sigmund Snopek's latest is a breathtaking 2-CD tour de force of intricately arranged progressive rock and fantasy. Labels just don't work here. I'll call it a classical progressive spacerock opera. Jesus Christ Superstar in the cosmos. 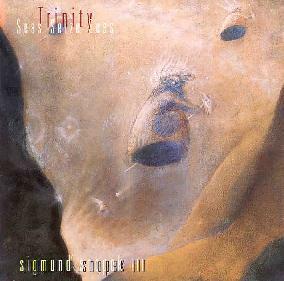 About half of "Trinity Seas Seize Sees" was originally recorded and released in 1974, the remainder having been completed since 1996 when Snopek decided the to return to "Trinity Seas Seize Sees" and add to the original recordings to achieve his full conception of the work. I'd been wondering why Snopek keeps mining from so many years in the past, but I can see how works of such magnitude would take so long to reach proper fruition. The story behind the music on "Trinity Seas Seize Sees" is that in 1973 Snopek became interested in spacerock as a genre, having discovered Hawkwind and Amon Düül and being an avid reader of science fiction. Snopek is a composer of highly orchestrated progressive rock and these influences reign supreme throughout the set. Not surprising as the promo material points out that Snopek has worked with virtually every arts in organization Milwaukee, including the Milwaukee Symphony Orchestra, Milwaukee Chamber Orchestra, Present Music, and Theatre X. Yet his interest in spacerock is subtly apparent (overtly at times) on many tracks and blended with the sci fi themes make for a stunning production that spacerockers who appreciate complex, yet accessible, progressive rock will enjoy. "Trinity Seas Seize Sees" is a concept work with the search for freedom as its theme. The main character - the Bubble Freak - is an extra-terrestrial who has lived on Earth for many years but is forced to returned to his own world by a trio of Controllers. To break free of the Controllers grip, the Bubble Freak travels through various worlds - the "Seize", "Seas", and "Sees" of the album's title. Following the lyrics and narration is essential to fully enjoy the work as a whole. It's also good fun as CD includes extensive liner notes, all the lyrics, and information on the MANY musicians who participated in the project. The music is primarily Snopek's style of orchestrated progressive rock, but added to the mix is jazz, fusion, psychedelia, and general avant-garde. "Rhyme Well" has a cool jazz sound, manic piano and quirky keyboards. "Controller's Reply" is jazz-rock that reminded me of Jesus Christ Superstar. "Arrival Boogie" is a freaky jazz boogie, but is cosmically jazzy á la Soft Machine or Gong. "That Is Why" even has hints of gospel at the beginning. And "Star Of Seas" is lulling classical progressive stylings along the lines of Camel or Anthony Phillips. I'm focusing on the stylistic variety heard throughout the set, but must emphasize that this is a tightly structured and cohesive work. Along more psychedelic lines is "Spirit Song", which is interesting for its classical progressive style with fuzzy wah guitar playing over it. "Move Very Quickly" is similar to "Spirit Song", but has even more freakout guitar. "Hypnotic Eye" is one of my favorite tracks. It's an intense psych-rocker with hints of the incensed East and screaming vocals that reminded me of Ian Gillan. "War And Carnage" is the one full blown spacerock track with its freaky synths backed by a dark orchestral drone. In summary Sigmund Snopek has produced a remarkable concept work that fans of challenging progressive rock will enjoy. The music is complex yet completely accessible for those willing to put in a little effort. "Trinity Seas Seize Sees" is distributed by Musea Records. They have a link on the main page to distributors around the world. You can also visit Sigmund Snopek at his web site.